Description: Elegance with a rustic touch. 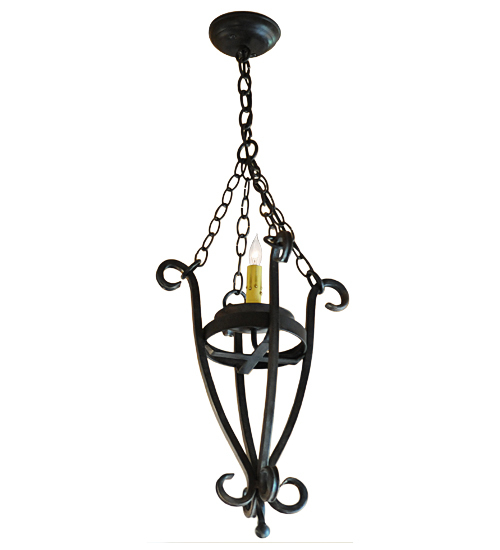 A Wrought Iron finished frame serves as the centerpiece of this handsome pendant. An Ivory faux candlelight illuminates while embraced by a bobeche attached to a sturdy frame with hardware featured in a matching finish. Highly skilled artisans utilize Hand Forged Iron techniques to create beautiful scrollwork. Custom crafted in our 180,000 square foot manufacturing facility in Yorkville, NY. Special sizes, styles and colors are available. UL and cUL listed for dry and damp locations.